"I Thomas Rowninge weaver being sicke in body but whole in minde I praise god for it "
Thomas Rowninge was a weaver by trade. He had a lot of stock which he lists in the Will, being linning (linen) and wolline (woollen cloth) as well as his looms. These items go between his sons Robert and Thomas. Apart from a small legacy to his granddaughter, he gives all the rest of his belongings to his Wife. He obviously contemplates that his sons will carry on his trade, and will support their mother. In the usual way he starts the Will by stating that he is sick in body but sound of mind (a statement to prevent queries arising after his death) and then by giving his soul to God and his body to the earth. He makes no mention of resurrection or similar matters, so it is possible that he was not strongly religious, although it is possible that this was the view of the person writing the will, and not that of the Testator. 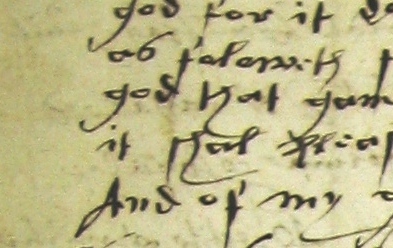 Thomas could not write, and he signed the Will by making his mark. The person who wrote the Will for him was probably Nicholas Johnson, one of the witnesses. 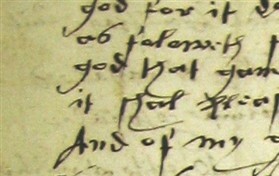 Note the distinctive way in which the letter 'H' is written, both in the Will and in Nicholas' signature, with a small loop at the top and a long swirling tail. He also has the habit of running together the letters 'T' and 'H,' so that the combined letters look rather like the letter 'Thorn,' this being an old letter of the alphabet which is still used in Iceland, but no longer in England. It looks here rather like a wicket with the middle stump missing, but it was often written like a 'Y,' which when combined with the letter 'e' to make the word 'the,' has been mistranslated as the word 'ye.' Ye meant 'you' at the time. 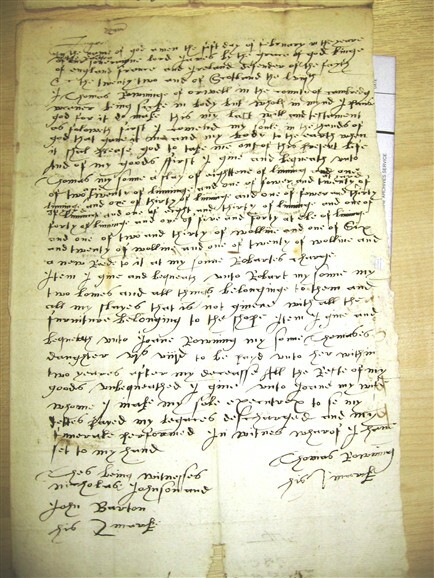 Good examples of the 'TH' can be seen in the word 'that' in the Will on both the 9th and 10th lines. 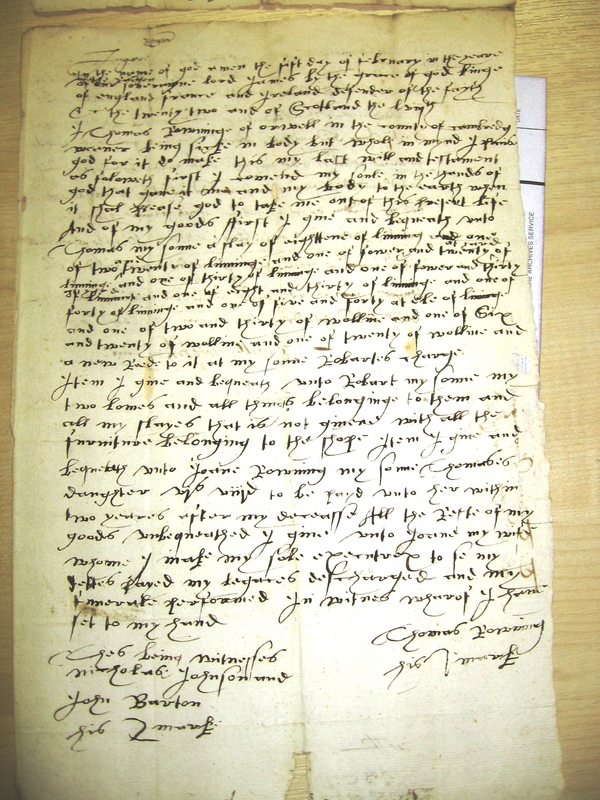 Nicholas also wrote the will for William Griggs (1613), and his handwriting in that will is just as bad! This page was added by David Miller on 05/10/2012.